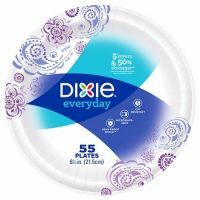 Strong and reliable Dixie® Everyday paper plates are the perfect solution for everyday meals and snacks. These are the only paper plates that i purchase for my family. I am very busy. Have no time to wash dishes so I use them everyday. I love them. This is one of my favorites, due to durability and it does not bend. We are able to use for daily stuff as well for parties. It saves me time to do other stuff. I have used many paper plates over the years and always come back to Dixie. Now I buy no other. In our home, we use them all the time. We are never out of them.